For my part, I just picked the “superhero” package at Enclave Publishing’s Kickstarter fundraiser that ends today at 5 p.m. Eastern time. Enclave Publishing is the new name of Marcher Lord Press, an independent publisher of Christian-themed fantastical fiction. Enclave announced its Kickstarter exactly a month ago on July 14. We announced it. 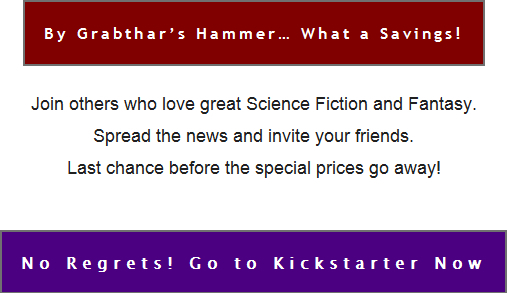 Some readers were critical of the Kickstarter approach and raised concerns. If you are one, do you have any further or modified thoughts — perhaps in light of Splickety magazine publisher Ben Wolf’s article Five Reasons Why Supporting Enclave’s Kickstarter Is A Good Idea? Meanwhile, SpecFaith accepts news about any publisher of Christian-themed fantastical fiction. Share your news (including about digital fundraisers) by sending us a News Tip.